Perhaps 1 in 10 books at the most touch me deeply to my core. This is one of them.It’s a beautiful book, both in appearance and in its message/story.I adore the illustrations. The story is about a boy (the author makes it clear that this is a book about himself as a youngster) who is left with his grandmother for the summer. She lives on the river and is an artist. The boy is unhappy at first, no other kids, no tv, and he has to do chores. But, he finds a raft and ends up experiencing a magical summer, and he discovers the artist in himself too.The boy and his grandmother are both very appealing characters, as are all the wild animals he sees and interacts with. I love how the boy is allowed to go out in the raft alone and is encouraged to be independent in so many ways; the grandmother is a fabulous mentor.This is a gorgeous book. It’s a book that I wish I owned vs. borrowed from the library, and one I can see giving as a gift. It’s a keeper! Jim LaMarche's illustrations always strike me with their warmth, beauty and sense of "life." This story is a fictionalized account of the summer in his boyhood when his passion for art was kindled, by the river and its animal inhabitants and by his artist grandmother and the inspiration she allowed him simply by letting him be free. A beautiful story! This book was selected as one of the books for the August 2013 - Summer Outdoor Activities discussion at the Picture-Book Club in the Children's Books Group here at Goodreads.This is a wonderful tale of being outdoors, exploring and learning more about nature, and spending time with extended family. I am so, so happy that I brought this book on our summer vacation trip up north to visit our family. I read this book once with our youngest and her cousin and then again with our oldest (she fell asleep before we read it last night.) It was certainly worth a reread. I love that the young boy wears a life jacket in many of the images (especially when he's alone and not tethered to the dock) which helps to reinforce the importance. Our girls grudgingly wear them when we go boating, so I appreciate the subtle reminder of their importance. Also, I love the focus on being outdoors (and not in front of a screen! )The narrative is entertaining and full of the wonders of nature and we absolutely loved the illustrations. The story has a soothing, reminiscent quality about it that makes it seem like an old, familiar tale and it certainly deserves a rare five-star rating. We really enjoyed reading this book together and I'm glad that I discovered through the Children's Books Group. Another easy-going, laid back tale that makes me wish for a quieter time and place of life. I would have loved to have a summer like this, close to animals and being able to draw them. And with a grandmother that just somehow understands. The book might be too long for the Book Time, as far as fitting it into the time frame or even keeping their attention. But it is definitely worth a book talk if I can squeeze it in. My favorite part of this book is that we're never told where the raft comes from. But we know. This is a faintly magical book with beautiful illustrations. The main character has a rough start and doesn't display the most admirable of behavior at first. Although this isn't really addressed, we do see a gradual transformation throughout the story, and a sweet ending. I love the story and the pictures.I will note that some mysterious ability is attributed to the raft; it seems to have a calming effect on the wild creatures. This is pretty mild, but something to be aware of. I am drawn to books with art that just sidles up alongside the words, blending the tale into a visual feast as well as an auricular feast. "The Raft" is just that ... a fine story and wonderful art. Nicky has to spend the summer with his grandmother, an artist living on a river. Nicky is not happy about having to be there away from his father. But he has no choice. He does chores for his grandmother and then begrudgingly heads off to fish or do some activity that she has set up for him. Before long, a raft comes to him on the river, and thus begins the summer of adventures for Nicky, He finds new worlds in nature, in art, in his grandmother. It's an especially fine story based on various real-life experiences of Mr. LaMarche's boyhood. He then gives them back to us in "The Raft". The drawings are soft and detailed of life on the river, Nicky up close and far off on the raft, animals drawn so beautifully real. They are done in a soft mixed-media paintings and are worth the slow reread just to look at every bird and fox and raccoon. 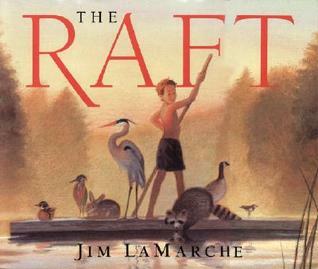 Awards for The RaftIrma S. and James H. Black Award for Excellence in Children’s LiteratureTexas Bluebonnet Award 2002-2003 finalistAn IRA Teachers' ChoiceIRA/CBC Teachers' ChoiceReading Level: 4 - 8 YearsJim LaMarche wrote and illustrated The Raft. He also illustrated Little Oh and The Rainbabies, both by Laura Krauss Melmed. He lives in Santa Cruz, California.His biography is @ HarperCollins:http://www.harpercollinschildrens.com...Mr. LaMarche ends with: "I feel very lucky to have ended up as an illustrator of children's books. And maybe that isn't so different from my childhood dream of being a magician after all. Starting with a clean sheet of paper and with nothing up my sleeves, I get to create something that was never there before." One of the best children books I have ever read, if not the best. The illustrations were amazing in this book. A perfect book for younger children who love animals and adventure. A great story about a boy and a summer with his grandmother at her lake house. There are endless ways in which you could build lessons about nature, animals, rivers, art, and family. So glad I found this book, only if I wish I would have found this book during my childhood. A boy goes to spend the summer with his grandmother, and finds a raft with animals drawn on the surface. It's his grandmother's, and she gives him some charcoal and paints to create his own animal portraits. I love the watercolor art with lots of warm browns, and all the animals. This is the kind of book I want to climb into and live in for awhile. This is so beautifully illustrated that it makes me wish I could go float down a river tomorrow...and that I could provide that type of outdoor/nature summer for my kids. So beautiful and peaceful. I love that it is loosely based on the author's own experiences. I've had this checked out for weeks from the library and never opened it. So glad I finally did. Luke and I both agreed that this is a 5-star kind of a book. Its also a pure Lukey kind of a book - all about a boy who discovers a love for nature and for drawing. Gorgeous illustrations and a very charming story. Luke wants to use his allowance to purchase this one for his library. What a wonderful story! My kids and I all loved this book about a young boy who reluctantly goes to spend a summer with his grandma. During his time there, he discovers a love of nature, adventure, art, and of course his Grandma! I ❤ this book. A true lover of nature! Kiley read this with me tonight for her reading challenge. What a wonderful summer. Reminds me of the exploring my boys did in Oregon.Read with Naomi & Simon. Absolutely gorgeous (story AND illustrations). Highly recommend. Great book for boys. Nicky is going to be staying the whole summer with his grandmother who lives beside a river in the northern Wisconsin woods because his dad has to spend all his time working at a plant. The boy just knows that he is going to be bored. There are no kids around to play with, and Grandma doesn’t even own a television. But she does have chores for Nicky to do, including fishing for supper, which is the worst chore ever. However, one afternoon, while Nicky is trying to catch their dinner, a raft drifts down the river towards him. He is able to stop it and tie it up to the dock. Grandma lets him play on the raft and even sleep in a tent on it when the summer nights are too hot to stay indoors. Sometimes she goes swimming with him off the raft.Every day Nicky rushes through his chores to get to the raft. During his summer adventures on the river, he sees foxes, a huge buck, a great blue heron, otters, and raccoons. But from where did the raft come? To whom does it belong? And on the last day of his stay, when he sees a fawn which is trying to cross the water and gets stuck in the mud, is there anything that he can do to help? This picture book, which was recommended to me back in 2003, was inspired in part by the author’s own childhood. A note by LaMarche, the illustrator of A Story for Bear and The Elves and the Shoemaker, describes the similarities between his own youth and that of Nicky. The Raft is a lovely, imaginative story about appreciating the simple, natural joys of the world accompanied by gorgeous pastel pictures of a wonderful summer on the river. Some over-protective killjoys might feel that what Grandma lets Nicky do is unsafe, but I think that it is nice to see how she quietly allows him to discover for himself the wonders of river life without being pushy. Kids can just relax with a slow, leisurely read about boy visiting his grandmother for the summer and experiencing excitement on the river while enjoying his encounters with the wildlife. The perfect summer read, especially if spending time with grandparents.Nicky will be spending a summer unplugged with grandma and he is not happy.As the summer progresses he discovers hidden magic in the forest with the help of a mysterious raft depicting animal drawings. He soon learns what it is he's supposed to do and his summer turns out to be quite the enchanted adventure.Gentle and capturing the transformation of feelings in this young, the author captivates us with a swirl of tales from his childhood and perfect illustrations to accompany the story. This fictional story of a boy spending the summer with his grandma is alright. I didn't care too much for the story line. On the plus side, I found the illustrations to be extremely captivating. As an animal lover I also was able to appreciate this book because of this aspect. It made me think about how I handle change and what coping mechanisms I use. I feel as if anyone can relate to this particular piece. If you don't think that you can, then you can at least enjoy the illustrations. Not a book for me, but I would still recommend it. With breathtaking artwork, Jim LaMarche gives one boy a summer of a lifetime. Going to grandmas was something Nicky did not want to do, but after falling asleep at the dock by his grandma’s cottage, his summer turned into one of the greatest he’s ever had. This story shows us that never get sad or have a moment of doubt when going to grandma’s house, because you never know what kind of summer you are going to have, or what kind of wilderness adventures that you will go on with grandma, and be surprised of how great it actually can be. Contemporary Realistic Grades: P-2This book was one that I think could be relatable to so many children. Not only is it an adorable tale of a boy and adventures he takes on this raft, but also the family situation that is going on is one that really made it relatable to the child from a split family that sometimes ends up in places where they don't want to be. I loved the adventurous tone throughout this book, as well as the good moral of taking care of animals. There really are so many good qualities about this book and I would love to have this in my personal library. The art was beautiful, the story was okay. A boy goes to visit his grandmother and learns to appreciate nature. The animals were a little bit too "Cinderella-y" for me with all the riding on the raft and landing on shoulders. A precious book about a young boy and his Grandma. It tells of a summer they enjoyed together on the river. I can’t wait to share it with my daughter’s boys. This is a great one-on-one about exploring nature and change. It's a bit to long for a read aloud with a crowd though. We read this over and over. Such a wonderful book, with gorgeous illustrations. Warm bright art, a simple story of a summer of natural wonders & discovery. It'd be great if everyone had a Grandmother or someone in their life like this! Absolutely beautiful book and a wonderful story. We all loved it. The story is of a boy who finally connects with nature as he spends the summer with his grandma. The artwork is beautiful (especially of the animals), and, as I read along with the story, I felt like I was on that river in Wisconsin. My only reservation about this book is the message isn't very original. A boy who likes video games and TV dreads the idea of spending a summer out in nature. It's what you'd expect, but "The Raft" tells the story well! Jim LaMarche - Jim LaMarche is the illustrator of more than twenty books for children, including Dennis Haseley’s A Story for Bear; The Carousel by Liz Rosenberg; The Rainbabies by Laura Krauss Melmed; and Albert by Donna Jo Napoli. He is the author-illustrator of The Raft. Jim LaMarche grew up in Wisconsin and now lives in California.